Ceiling Fan Direction. Which way should your ceiling fan turn in the Winter and Summer? The above animated ceiling fan is spinning clockwise (reverse). This is the fan direction for Winter or when it is cold outside. Winter time Ceiling Fan Turn Direction (Blade Rotation): Which direction for ceiling fan in Winter? Lets say it is Winter time and you want to set your ceiling fan to spin in the correct direction. When looking at your fan from below, the fan should be turning clockwise, or in reverse. The reason for this reverse spin direction is so the fan can pull the air from the floor upwards towards the ceiling. The air is moved in an upward motion for Winter because heat rises and this is the best way to mix the warm air above your head. This fan direction will not blow the air directly on you which is best when it is cold outside. Setting your fan to spin in the clockwise direction in the Winter will help you save money on your electric bill. This will help you save money by the fan pushing the warm air near the ceiling downwards. Your homes heater will not have to work as hard therefore saving you money. If your fan is spinning the wrong way, there is a small switch located on the metal housing that needs to be switched in the opposite direction. Make sure to turn the ceiling fan off before you reach your hand up to turn the switch or the fan blades will hit your hands causing injury. The above animated ceiling fan is spinning counter clockwise (forward). This is the fan direction for Summer or when it is hot outside. Summer time Ceiling Fan Turn Direction (Blade Rotation): Which direction for ceiling fan to cool? 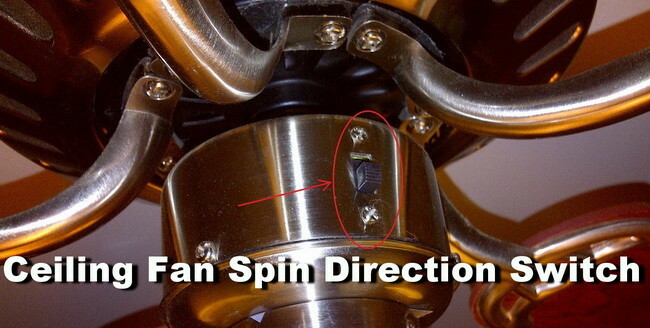 Lets say it is Summer time and you want to set your ceiling fan to spin the correct direction. When looking at your fan from below, the fan should be turning counter clockwise, or forward. The reason for this forward spin direction is so you can get as much airflow as possible when it is hot outside. The fan will be spinning in the direction to push or blow the air down directly on you, therefore cooling you off faster. This is called “the wind chill effect”. Setting your fan to spin in the counter clockwise direction in the Summer will help you save money on your electric bill. This will help you save money by the fan blowing cool air directly on you and cooling you off faster. Your homes A/C will not have to work as hard therefore saving you money. If your fan is spinning the wrong way, there is a small switch located on the metal housing that needs to be switched in the other direction. Make sure to turn the ceiling fan off before you reach your hand up to slide the switch or the fan blades may hit you and cause injury. Ceiling Fan Blades: A ceiling fans blades are pitched. This means they are turned at an angle to push or pull air depending on the direction they are turning or spinning. The specific angle of the blades pitch will determine amount or force of airflow. Some ceiling fans are made to create extreme airflow and others (most home ceiling fans) are angled at a pitch that gently mixes the air for a more even temperature. Ceiling Fan Direction Switch: The ceiling fans switch to change the direction of the spinning fan blades is usually located on the bottom portion of the fan. Some ceiling fans may have the switch located on the motor housing or above the motor housing. When you need to flip the direction switch, make sure to turn the fan off so you do not injure yourself by the spinning fan blades. This is the best answer. Plus showing the direction of the fan in animation is awesome, because I didn’t know whether it was looking up or down at the fan. Thanks! I always if it is super cold turn the fan off. I love ceiling fans and will run them anytime of year but 45 degrees and lower too cold. I don’t reverse anymore. I’m okay with ceiling fans being non reversible. I’d also prefer 2 or 3 speeds. If the fan only has 1 speed it doesn’t work for me. We have an open area, 7,000 Square Feet and our current air conditioner is not enough to cool down the temp. I am thinking to put up about 15 ceiling fans to make our participants feel more comfortable instead to install large unit of air con. Some of my college thinks that ceiling fans will cause the quality of air turn to be bad inside the area, is this true? please reply, thanks. A ceiling fan will not directly make the air quality less healthy. A ceiling fan can however move more dust around causing more unhealthy things to be in the air. However it may be a better option to install another A/C instead of 15 new ceiling fans. If a new A/C is out of the question and ceiling fans are the way you are going to go, make sure you purchase the most efficient fans possible. You may also be able to purchase commercial ceiling fans at 15 at a time and optimized to save electricity and move more air.